The Citation Brown kraft shoppers made from 100% recycled paper (with a minimum of 95% recycled post-consumer content) with matching twisted paper handles and serrated cut top. 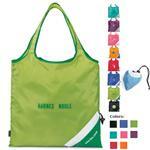 All with your custom logo - great for the plastic bag bans and more! 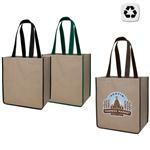 An eco promotional item. 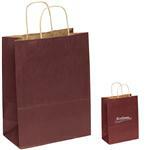 13"W X 6" X 15 3/4"H.
Available Colors: Brown Paper Kraft. Production Times Available: 7 working days. RUSH AVAILABLE - INQUIRE. 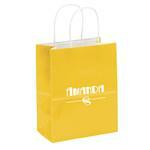 Available Imprint Options: Add $0.13 for each additional color. 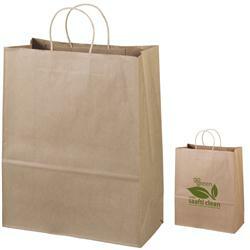 Recycled and Recylable Karft Custom Paper Bags. 95% post consumer material.